The Gray Report: Is Korbel the best sparkling wine in America? A Korbel Brut bubbly won the sparkling wine sweepstakes at the San Francisco Chronicle Wine Competition last week. A different Korbel Brut bubbly won the same award last year. The competition is the largest in the world for only American wines, with more than 6000 entries this year. So does this make Korbel, some of which can be found for under $10, the best sparkling wine in America? At this point you are expecting me to invoke Betteridge's Law of Headlines, which states that any headline that ends in a ? can be answered "No." But I'm not gonna, not right away anyhow. Big wine competitions sometimes come up with exciting results for cheap wines -- and cheap wine drinkers. The ultimate was in 2007, when Charles Shaw was named the best Chardonnay in California at the California State Fair. But examples abound. I was part of a jury once where the majority picked a nondescript $10 Italian red blend as best in show -- the best wine in the whole competition -- over a tête de cuvée Champagne and a terrific Chianti Classico. You can tell from my language that I didn't concur. The argument that the red blend's proponents made was that it was perfectly balanced and easy to drink, which should be the goal of all $10 red blends, though we didn't know the price. The Chianti Classico and Champagne split the "we want more than that" vote and the red blend won. I think about that vote a lot, and wonder which wine would have won had it been open to the public. We'll never know, but research has shown that the general public tends to choose cheaper wines in blind tastings. People in the "we want more than that" crowd have all of wine media to give them information. There's no media I can think of that tells people where they can find a balanced, easy to drink $10 wine. Even people who write mostly about $10 wines generally recommend $10 wines that taste like $25 wines -- more complex, more varietally correct, more interesting. Bill Ward was one of the judges at the Chronicle competition. I asked him by email about the Korbel wine. He told me, "The wine was actually quite tasty, a bit bracing, nice mouthfeel and clean on the finish. There were only three sparkling wines in the sweepstakes, one of them a moscato that also was tasty. When the winner was announced, there were a lot of 'wows' in the room. I was surprised but not shocked, partially because about three years ago at the Riverside Competition, a Barefoot Brut had won. It’s a wine I’d be happy to drink. It reminded me a bit of the Gruet Blancs de Noir, which I quite like." It's likely that some of the leaders in California sparkling wine didn't enter, because what do they have to win? It costs wineries to enter, and for say, Schramsberg, they're not going to convince the high-end wine-drinking crowd that their top-of-the-line J. Schram, which costs nearly $100, is worth it by flaunting a gold medal, or even a best-in-show medal. Korbel, on the other hand, has tens of thousands of cases to move, and Ward suggests that gold medals are more impressive in the heartland than on the coasts. The chance of winning an award like this was well worth the entry fee. Besides, I'm not convinced that Korbel is not, right now, the best sparkling wine in America, depending on your parameters. 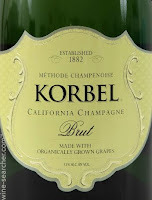 This year's winning wine -- Korbel Brut Natural -- costs under $14 in many places (buy it here). Last year's winning wine -- Korbel Brut made from organically grown grapes -- is about the same price (buy it here). Just three weeks ago most newspapers in America ran crappy articles about sparkling wine. Many magazines and websites did too. The thrust of the pieces I read was how readers who don't want to spend money on bubbly but feel obligated to do so anyway can get something decent cheaply. Its competition is not Champagne; it's competition is André or bottom-shelf Cava. For many people next December, to drop $15 on one of Korbel's best-of-show wines will mean spending more than they planned. If that's you, and you clicked on this post because of the headline, then yes, spend the money, because Korbel may be the best sparkling wine in America. Korbel is not Champagne, though. Champagne comes from a place. No surprise here, Mr. Gray. I've been doing an annual holiday sparkling wine tasting at a newsweekly, among casual wine consumers not "experts," for some years now, and Korbel often shows well. Yes, we did the J. Schram once, too. I am only surprised that it's the "Natty K," as I like to call it, that took the prize over the regular brut...the "Natural" usually smells oddly piney to me...but I think that, in context, it'd be especially fun to reproduce my writeup of the Korbel Brut here: "Korbel does a fantastic job for the price. This is the kind of all-around pleasing sparkler that wine critics might describe as 'surprisingly complex,' trying to walk back the high score they gave a domestic wine in a lineup of more expensive bottles. Lean, lemony and balanced with shouts out from yeast and lemon cream, this reliable sparkling wine should never be overlooked for its ubiquity." NO it is not ... and you stated yourself that many of the top California Sparkling wines were not entered. Maybe you should rephrase the article to "Is Korbel the best CA sparkling wine that entered This competition. "Is Korbel the best sparkling wine in America?" - Heck, no!